THE FIX doesn’t look like one. ABC: AMERICAN IDOL dropped 0.2 from Sunday night to 1.1, an all-time low for the series. THE FIX premiered at an unimpressive 0.7, down 0.6 from last week’s THE GOOD DOCTOR. NBC: THE VOICE easily won the night, but it was down 0.3 from last Monday to 1.7. THE ENEMY WITHIN slipped 0.1 to 0.8. FOX: THE RESIDENT aired a new episode for the first time since February 18, and was steady at 0.9. 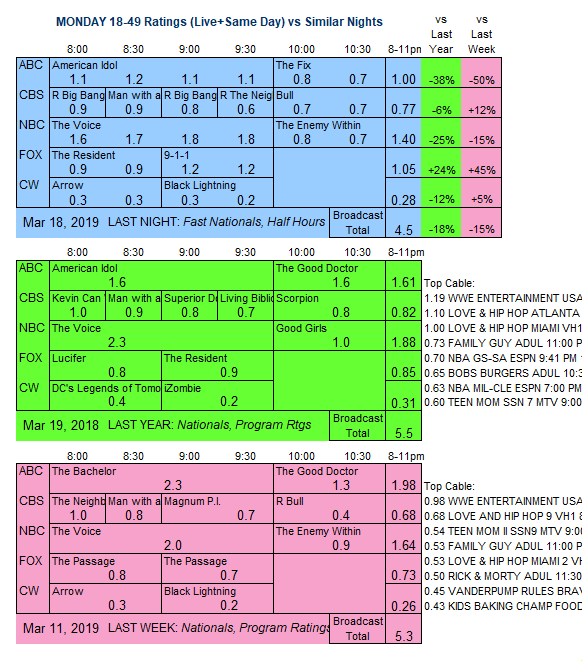 9-1-1 returned from a hiatus that started on November 26, and was down 0.2 to 1.2. 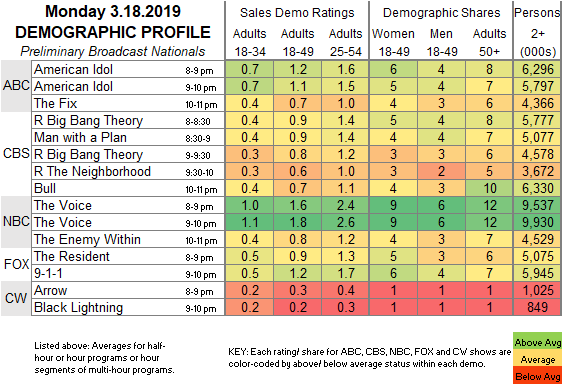 CW: ARROW (0.3) and the season finale of BLACK LIGHTNING (0.2) were steady. CBS: The night’s only new sitcom was MAN WITH A PLAN, up 0.1 to 0.9 amid reruns at 0.6-0.9. BULL aired its first new episode since February 25 and dropped 0.1 to 0.7. Tonight, NBC introduces THE VILLAGE in the coveted post-THIS IS US slot.